Interesting that friends just told me about this, yesterday. 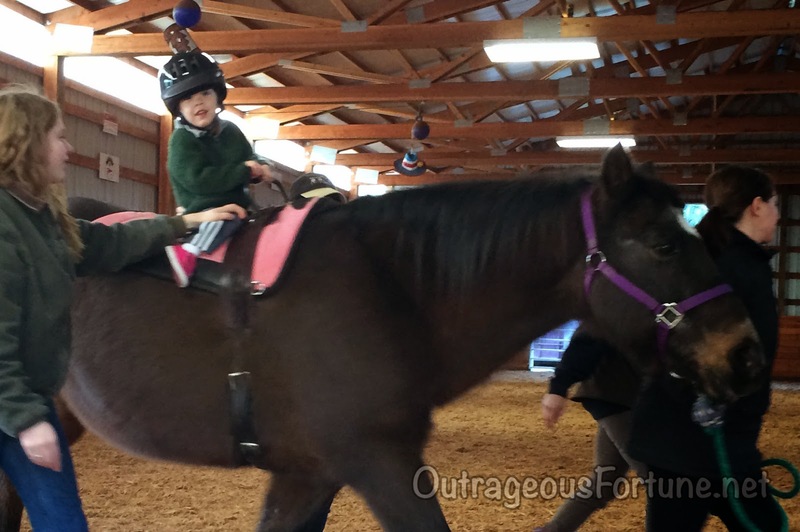 Her daughter didn't walk until almost 3 years old, and riding horses helped her muscles adapt to enable walking. The therapy changed as the child's body "loosened-up"... one type horse/saddle was used at beginning, then others as she progressed. Want to tell Thaddeus about it, but... one of the therapy-riding stables just closed, here. They have trouble being profitable. ??? We're getting K back on the horse today, after more than a year off. We'll see how it goes at this new place. Hippotherapy is a greek word: (H)ippos (ίππος) is the ancient greek word for the horse. In modern greek the horse is called "άλογο" (alogo) but we still use the root ''ippos'' in words like "ιππασία" (ιppassia) which means ''riding'', "ιππότης'' (ιππότης) which means ''knight'' (because knights ride horses) etc. therapy (θεραπεία) is the greek ancient and modern word for ''cure'' or ''treatment"
I believe that ippotherapy is really helpful. Hippocrates, the famous ancient Greek doctor, recommended it for a lot of conditions. But maybe 3,5 is a little too soon to start. Here in Greece, a child with special needs must be at least 4 to accept him/her for hippotherapy and 6,5 for a typical child to start riding lessons. Hi there, came across your blog whilst googling my midwife. Would just like to say hello from a fraternal twin who has CP. Hello!